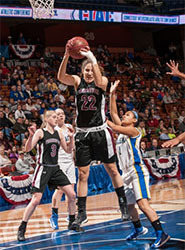 UNCASVILLE - Sophie Borg and Brittany Belisle each finished with 11 points as No. 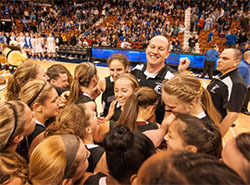 10 Farmington stunned top-seeded Bacon Academy 49-44 to win the Class L state championship Saturday at the Mohegan Sun Arena. It is the first state championship in school history for the Indians (22-5), who led virtually the entire way, going up by as many 12 points in the second quarter. "The whole thing for us was we used other people saying, 'You guys are Cinderella, you came out of nowhere,'" Farmington coach Russ Crist said. "In the locker room, we never felt like that. We talked about our team beating anybody if we played our best." Bacon Academy (24-3) was the defending champion. "You have to give Farmington a lot of credit. They did a really good job," Bacon Academy coach Dave Shea said. "Surprisingly, they outrebounded us. (39-32 Farmington)." Taylor McLaughlin had a game-high 25 points and 12 rebounds for the Bobcats. "I'm upset we didn't win the game, but teams don't always get to do this," McLaughlin said. "Only two end up here and one wins. There's so much to be proud of. ... I'm not going to let one thing ruin it." The day session crowd had a 4,486 announced attendance at the Mohegan Sun Arena. Points in the paint-FARM 20,BACON 20. Points off turnovers-FARM 11,BACON 9. 2nd chance points-FARM 19,BACON 7. Fast break points-FARM 2,BACON 0. Bench points-FARM 13,BACON 0. Score tied-1 time. Lead changed-1 time. Last FG-FARM 4th-01:50, BACON 4th-00:02. Largest lead-FARM by 12 2nd-02:46, BACON by 1 1st-07:48. Technical fouls: Farmington-None. Bacon Academy-None.